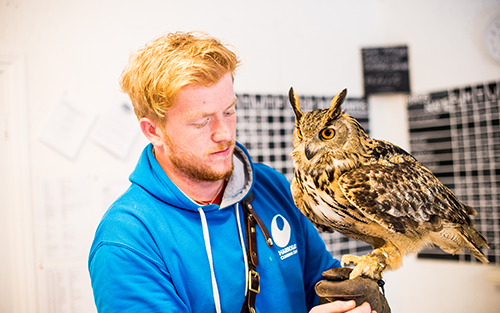 The National Centre for Birds of Prey is the largest collections of these amazing birds in the north of England. Housed in spacious aviaries you’ll find vultures, eagles, owls, hawks, falcons and more. A team of trained birds flies free for our visitors every day. Located on a large site among the veteran oaks and rolling parkland of Duncombe Park is the northern branch of the National Centre for Birds of Prey. 40 aviaries house an impressive collection of these wonderful creatures. In addition our “Hawk Walk” houses many of our trained flying birds – these can be easily viewed at very close quarters and make impressive subjects for photography. Every day (check website for details) we fly the birds for our visitors. The smallest of our flying team weighs the same as an iPhone; the largest has a 71/2 ft. wingspan! Each flying demo features different birds, so it is worth staying for more than one. We have two outside flying areas and even an indoor flying area for wet days, so whatever the weather, you’ll get to see a flying demonstration. The Owl House Café is a new addition for 2015. Serving a range hot and cold meals and snacks, hot and cold drinks and ice cream; the café specialises in serving locally grown and produced food. There is plenty of seating both inside and out. There’s plenty of free parking and access in to the surrounding 400 acres of parkland is included with the admission price. We open at 10am and we recommend you allow 2-3 hours for your visit, but many visitors come for the whole day!